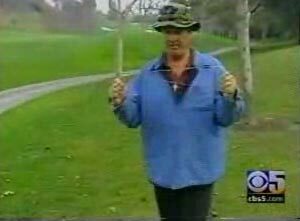 Jack Coel Water Dowsing service locates and marks the best location to drill your well, tells you how deep you will need to drill, and how many gallons of water a minute you should expect to get. Jack Coel has dedicated his life to finding water. 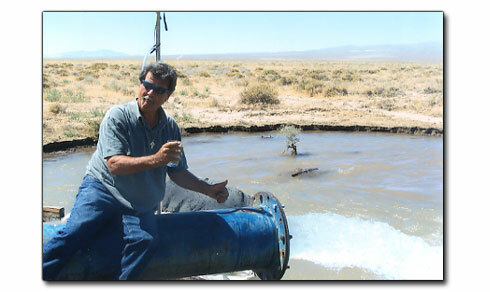 He is an expert in the field of Water Dowsing, locating municipal and agricultural water wells. I have been dousing for water now for 44 years. Before that, I spent 8 years locating underground utilities on 4 continents. People do not call for areas where it is easy to make water. It's always after dry holes or known difficult areas. I work all over North America. 2017 was my biggest year to date. My largest well in 2017 was 2,500 g.p.m. near Lake Berryesa CA., a difficult water area. I thank God for my mission. In my opinion to call yourself a Water Dowser, you must be full time, to do as much as you can, find out results and learn. It is not like other occupations, information and opportunities to learn are not readily available. I can do a certain amount of carpentry, electrical and other skills. It does not make me any of those things. Unfortunately, almost all people claiming to be Water Dowsers, do it as a sideline, do not advertise, and do not travel out of their local areas. In doing so, they may be 20-30 locations a year. Drillers don't pay attention to them. They don't learn results of their work. You can work year after year that way and not learn anything. I include drillers who claim to be Water Dowsers. Big conflict of interest, hard to be objective with a contract in your back pocket. Still outperforming science and technology. I am a Christian, called by Christ many years ago to find water (Matt 7-7, seek and ye shall find). My mission in life is to glorify Christ by providing water well locations through water dowsing. I have provided over 10,500 water well locations, water dowsing in the last 47 years. I regularly and consistently outperform science and technology. I am the only full time water douser in the west. Large municipal or agricultural locations as well as domestic sources are identified. I worked through the drought of 1976-77, the drought of the century I worked through the ten year drought 1983-92. I continue to work through the current three year drought, the worst drought on record in California, continuing to find water well locations, water dousing. I have learned how large water courses need to be, to be reliable through these droughts. I have developed a method for determining which of those is the best target to drill for and strike on your property. I provide an estimated depth to last water, a production estimate in gallons per minute and can determine quality. It is not necessary to wait until summer or fall to find your locations, when driller’s waiting lists are the longest. My success rate is consistent throughout the year. The following pages are proof of results, no one else can offer. Over the years, I have provided water well locations, for the U.S. Department of Interior, U.S. Bureau of Land Management, State of California, many municipalities, many agricultural wells, water dowsing. I am at the top of all internet search engines worldwide. There are drillers, who also do some water dowsing. This is a highly questionable practice, and you should understand there is a serious conflict of interest for them. You want a good objective evaluation of water availability on your property, they simply want to secure the job. My water dowsing charge is $1475.00 per parcel, for a two hour appointment. I regularly cover over 100 acres in that time. After that time, I charge $750 per hour. My fee typically amounts to the cost of 20-30 feet of drilling, and send you after your best source with a plan. Please call to schedule an appointment or if you have any questions. 5th day of 7 day pump test at 5,000 BPM. 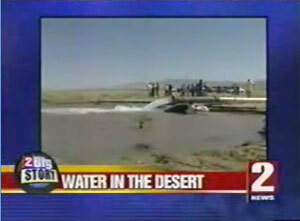 Aqua Trac water project began in 1986. 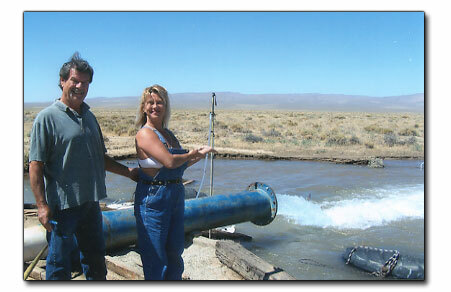 In the south Winnemucca Lake area, one existing well with 1,000 gallons per minute was known. Aqua Trac was hoping to find 10-15 of these 1,000 gallon per minute wells. Aqua Trac had drilled many dry holes over the years, behind satellite imaging, radar and Geologists. Over three hundred million dollars was invested before I was contacted, and 1 million acres secured. 1,600 square miles, 40 miles x 40 miles, all covered in 24 hours while standing in the back of an open Jeep. On our last trip in spring, my wife Pam and I were told by Tom Galleger, president of Aqua Trac, that a couple of weeks earlier Tom had spoke with the Secretary of the Department of Interior about my well sites and both State Senator and Governor supported the project. I had found BIG WATER in Granite Springs Valley many years earlier, looking at the same B.L.M. land with an accountant, for a project that never got through B.L.M. hoops. When I found these locations again, I told Tom, Lynn and Ryan that these would be my biggest wells ever. I expect after developing well, field and pipeline project to Reno and Fernley, this project served by my locations will cost a billion dollars easy. My well, in Desert Well DVD Ch. 2, was the most recently drilled of three of my well sites drilled 2005-2006, two others were estimated at 4,000-6,000 g.p.m. were blown up and are now being investigated. Aqua Trac, according to Ch. 2 DVD, needed 10,000-15,000 g.p.m. for their pipeline to Reno and Fernley, my three well sites provide all that and more. Jack Coel is a full time Dowser, some people call it water witching. 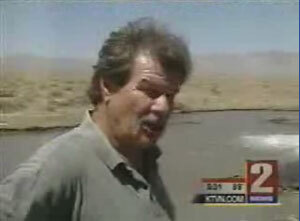 Jack has been Dowsing for over 38 years and does over 400 locations a year. Jack Coel is listed in 34 telephone Directories and up to 10 newspapers. Jack travels over 70,000 miles a year to produce as much water as possible.